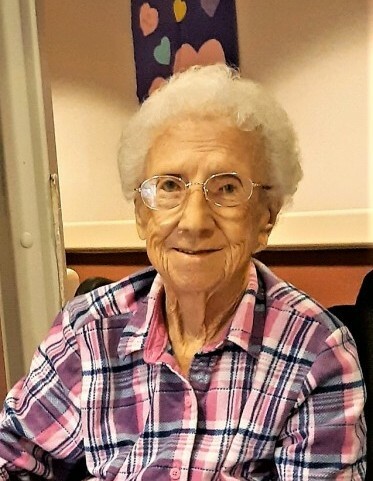 Patricia M. McIntosh, 90, Martinsburg, formerly of Altoona, entered into eternity, Tuesday afternoon, January 29, 2019, at Maybrook Hills Rehabilitation and Healthcare Center, Altoona. She was born in Duncansville, daughter of the late Matthew H. and Myrtle M. (Kunsman) Himes. She was twice married, first to Clyde McIntosh and then to Samuel Bush, both of whom preceded her in death. Surviving are a son, Gary Allen McIntosh of New Concord, KY; five grandchildren: Carol Sue Mowery, Terry Lee, Yvonne, Jennifer and Trisha McIntosh; four great-grandchildren; and many nieces and nephews. Patricia began working as a seamstress at the Lingerie Store, Hollidaysburg, and also worked for many years as a sewing machine operator at Saf-T-Bak, Altoona. She enjoyed flower gardening, was very creative in designing floral arrangements and also made and sold cakes for many different occasions. Friends will be received from 5 until the 6 pm memorial service, Thursday, February 7, 2019, at John K. Bolger Funeral Home Inc., Martinsburg, Pastor Brian L. McCall officiating. Memorial contributions in memory of Pat can be given to the Central PA Humane Society, 1837 E. Pleasant Valley Blvd, Altoona, PA 16602, or Mending Hearts Animal Rescue, PO Box 97, Hollidaysburg, PA 16648.